Do you like to paint landscapes or city scenes, but hesitate to add figures to your scenes? Adding a figure to your scene can really make it come alive. This 3 day workshop will explore how to create simple, gestural figures that bring life and scale to a scene. In this workshop you will practice painting simple figures with minimal facial features, learn about figure perspective, and make them feel natural in a landscape or city scene. The class is limited to 6 students allowing for lots of one on one time with me. Fees: $145 if paid in advance or $160 at the first class. Lori, don't think I've ever seen your "Afternoon Delight"...it is a wonderful painting full of color and motion. Landscapes and people...that would be quite a challenge for me! Thanks Johanna. 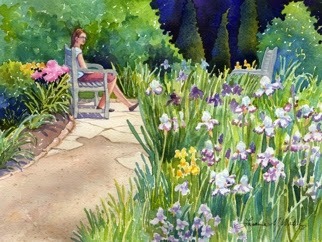 "Afternoon Delight" is an older painting from the Denver Botanic Gardens. I bet you would do great with landscapes and people! Thanks Lori for always replying. I tend to get too tight with landscapes. I do like the airy way in which you accomplish them.